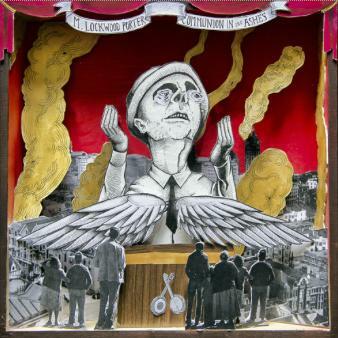 M. Lockwood Porter's Communion in the Ashes is a rallying cry for the hopeless and heartbroken, its lyrics set to a soundtrack of anthemic heartland rock & roll. This is a record that addresses our modern-day social problems from a perspective of hope, encouraging those who listen to focus on activism and community-building rather than despair. Along the way, Porter delivers some of the most engaging, electrifying songs of his career, rooting these melodic calls-to-action in the stomp and epic swagger of a five-piece road band. With Communion In The Ashes, Porter crystallizes a sound that is uniquely his own: one that gatecrashes the borders between indie rock & roll, singer/songwriter folk, and Americana. Written alone on the acoustic guitar and recorded with Porter's band during a collaborative, five-day studio session in Chico, CA, the album champions togetherness as an antidote to the immense problems we face as a society. On the kinetic title track, a kick drum bangs out a steady pulse while Porter unveils his game plan: "When the bridges are all burned, let's congregate the masses, let's hold a new communion in the ashes." The song doesn't turn a blind eye to the desperation of today's world; instead, it builds something new from the rubble, transforming desolation into hope. A similar feeling imbues the piano-propelled "I Will Do No More A-Prayin’," a secular hymn that nods to Porter's childhood days in the Southern Baptist church. If "I Will Do No More A-Prayin’" evokes the solemnity of Sunday morning, though, the bulk of Communion in the Ashes rustles up the thrill of Saturday night. There are furiously strummed power chords, pounding percussion, vocal harmonies, and 80s-inspired synthesizers, shot through with a voice that's urgent, compelling, and quick to incite. These are songs about revolution and rebuilding, and Porter sings them accordingly, his voice echoing and rattling its way between the electric guitars and upright piano.